The Autonomous Office is a project located in the Science and Technology Park at Gijon, in Asturias (Spain). This Park is the location of reference in Gijon destined for the establishment of knowledge-intensive companies, the performance of R&D&i activities and the development of new pathways for technology transfer. The objective of the “Autonomous Office” project is the construction of a sustainable, energetically selfsufficient building which will reduce the environmental footprint to a minimum; for this reason it has been awarded the LEED Platinum Certificate. Onyx Solar® is participating with the installation in the building of various integrated photovoltaic solutions, which are the main source of power generation. Thus, by replacing traditional building materials with multi-purpose photovoltaic materials, in addition to creating clean, cost-free electricity from the sun, the power requirements of the air handling and lighting systems are also reduced by controlling the sunlight and increasing thermal and acoustic insulation. 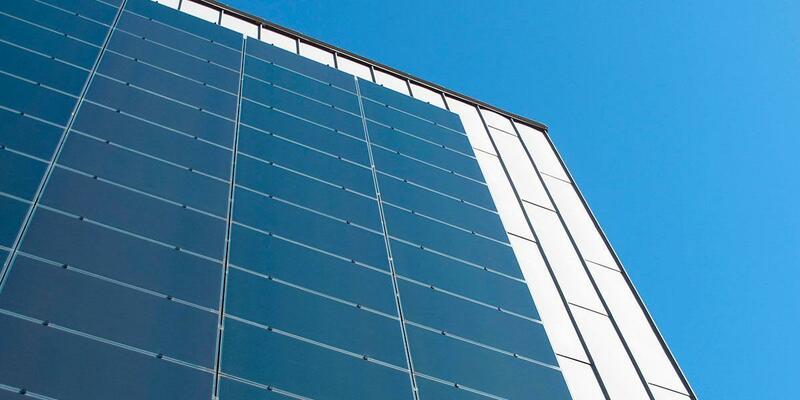 The photovoltaic technology employed on two of the façades of this building is CIGS technology (Copper, Indium, Gallium and Selenium), which produces a peak installed power of 24.5 kWp and which will generate 10,686 kWh per year. It will also prevent the release of 3 tons of CO2 into the atmosphere. The project is co-financed by the European Union via the LIFE+ programme in the thematic field of Environmental Policy and Governance (LIFE11 ENV/ES/000622).